Would Britain be great without the Normans? Monty asks if Great Britain would have become a great nation without the martial input of the Normans. Of course we can’t know for sure what would have happened if the Normans hadn’t crossed the Channel, but to answer the question briefly I think the answer is ‘no’. Without the Normans I doubt there would even be a Great Britain much less a British Empire. The union of Scotland and England into a new entity called Great Britain came about with the Act of Union in 1707 (Ireland wasn’t officially added until 1801), but despite the late date it was the final act in a play that had begun with William the Conqueror. The Anglo-Saxons were always more defensively minded than the Normans. Harold and his predecessors had contacts with the neighboring kingdoms- Godwin’s family involved themselves with both Macbeth in Scotland and Diarmait mac Maíl na mBó in Ireland- but never on a large scale. Where they did exert themselves (the Welsh border for example) they settled for a sort of ‘over-king’ recognition. Scotland was more organized and therefore a more difficult conquest, and if one of Harold’s successors had the inclination and ability to pull off an invasion, they most likely would have tried to impose the same kind of recognition. Ireland on the other hand, was probably too much of a stretch even for the most ambitious Anglo-Saxon king. The Irish Sea was notoriously difficult and the English didn’t yet see the value of a fleet. The real obstacle to an Old English empire was the Anglo-Saxon style of fighting. They didn’t have professional armies, and shield walls (as the name implies) are better for fending off an attack than carrying out one. The Normans by contrast, had both the organization and more importantly the desire to invade. They cut a swath through medieval Europe dominating the stage for over a century and rarely losing a battle. Their heavy cavalry raids were nearly unstoppable- there is no better example than at Cerami in Sicily where 500 Norman knights smashed an army 70 times their size. It was this martial spirit that carried Norman arms into Ireland, Scotland, and Wales, and triumphed at Crécy and Poitiers. The Act of Union- and the British Empire- was the end result of that drive. One final postscript: I think the Anglo-Saxons generally get short-changed by historians. The heavy cavalry charge that saw the Normans to victory in nearly every battle dramatically failed in two cases. The first was at Hastings- the shield wall/axe-wielding huscarls more than held their own against repeated charges. The English lost because their discipline let them down- they abandoned the higher ground in scattered groups to chase fleeing knights and were butchered out in the open. The second case was exactly fifteen years later near the Albanian city of Dürres. 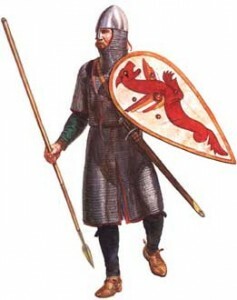 The Varangian Guard- composed largely of Anglo-Saxon refugees met the Norman army of Robert Guiscard. Once again the Norman charge failed and the Anglo-Saxon huscarls inflicted horrendous casualties on the attacking cavalry. Unfortunately for the English, large segments of the imperial army chose that moment to desert and the Varangians were left exposed and surrounded. The result was a second defeat, which effectively obscured what the English had accomplished. They might never have become a great power with a defensive mindset, but the fighting abilities of the Anglo-Saxons stopped the foremost military machine of the 11th century in its tracks. Twice.